Is This Australia's Harshest Critic? He's taken on everyone from Katy Perry to Iggy Azalea. Tyson Wray is a Melbourne based writer who has become known for his scathing mX album reviews. There was the time that Anthony Callea ruined Christmas: "Mothers – if you receive a copy of this from your children then they clearly harbor emotional resent against you." And the Katy Perry album that made him question his sexuality: "She promotes the most insipid and aurally offensive brand of pop music... alongside trite lyrics that revel in gratuitous sexual euphemisms passing as female liberation to sell records." 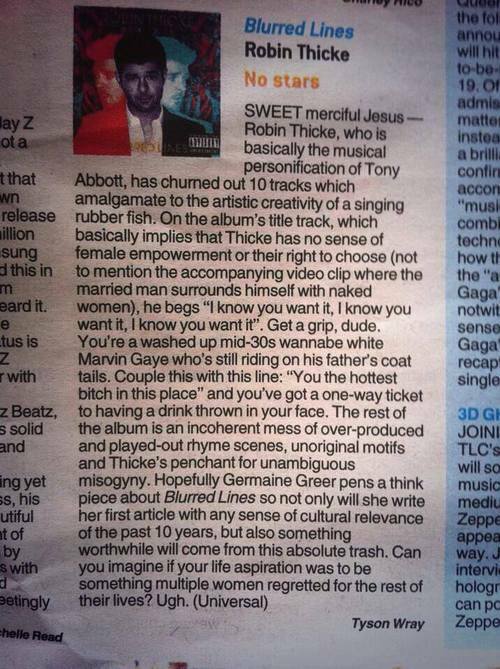 In this review, he manages to insult both Robin Thicke AND Germaine Greer: "You're a washed up mid-30s wannabe white Marvin Gaye who's still riding on his father's coat tails." He compares will.i.am to musical herpes: "Britney Jean reeks of the same type of dsperation you might see from a recently divorces 49-year-old woman hitting on a 21-year-old man." ...MKTO to Jar Jar Binks: "Their self-titled debut record sits alongside the dredging of the Great Barrier Reef and Western Australia's shark cull in highlighting everything that is currently wrong with this country." ...and Iggy Azalea's lyrics to online creepers: "To think that there are some people who work soul-crushing 9 to 5 jobs and then wilfully spend their money on this sort of trash is a dark realisation. We are truly no longer the lucky country." He's had enough of Lady Gaga's 'art': "At least it'll give her deluded and obsessive cult-like fans another 59 minutes of background music to listen to while they spend their days slapping themselves and crying like Annette Bening in American Beauty." He does bring up a good point about Fatman Scoop though: "The fact that there are people who can legitimately enjoy Skrillex is a far greater mystery than missing Flight MH370." For his 100th review published in mX, he celebrated by analysing the Gwyneth/Chris breakup: "This is what you get from some of the world's most monotonous musicians and a lyricist who takes relationship advice from BuzzFeed quizzes." Tyson Wray's Facebook cover photo really says it all. Do you agree with these reviews? Let us know what you think!